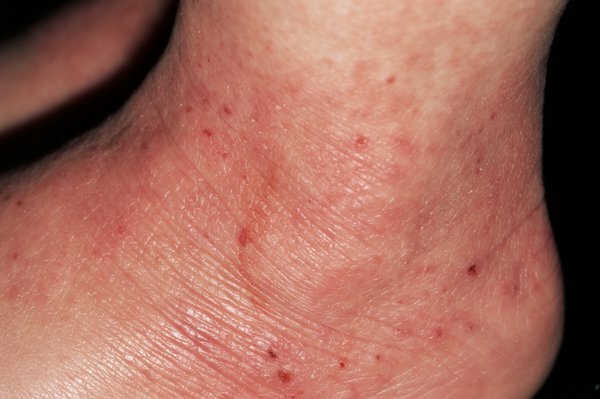 Atopic eczema causes areas of skin to become itchy, dry, cracked, sore and red. There are usually periods where the symptoms improve, followed by periods where they get worse (flare-ups). Flare-ups may occur as often as two or three times a month. Atopic eczema can occur all over the body, but is most common on the hands (especially fingers), the insides of the elbows or backs of the knees, and the face and scalp in children. The severity of atopic eczema can vary a lot from person to person. People with mild eczema may only have small areas of dry skin that are occasionally itchy. In more severe cases, atopic eczema can cause widespread red, inflamed skin all over the body and constant itching. Scratching can disrupt your sleep, make your skin bleed, and cause secondary infections. It can also make itching worse, and a cycle of itching and regular scratching may develop. This can lead to sleepless nights and difficulty concentrating at school or work. Areas of skin affected by eczema may also turn temporarily darker or lighter after the condition has improved. This is more noticeable in people with darker skin. It's not a result of scarring or a side effect of steroid creams, but more of a "footprint" of old inflammation and eventually returns to its normal colour. See your doctor as soon as possible if you think your or your child's skin may have become infected. Read more about infections and other complications of atopic eczema.